OK, so what’s a nacatamale? You may have guessed that it’s related to the standard Mexican tamale that many Americans are familiar with. 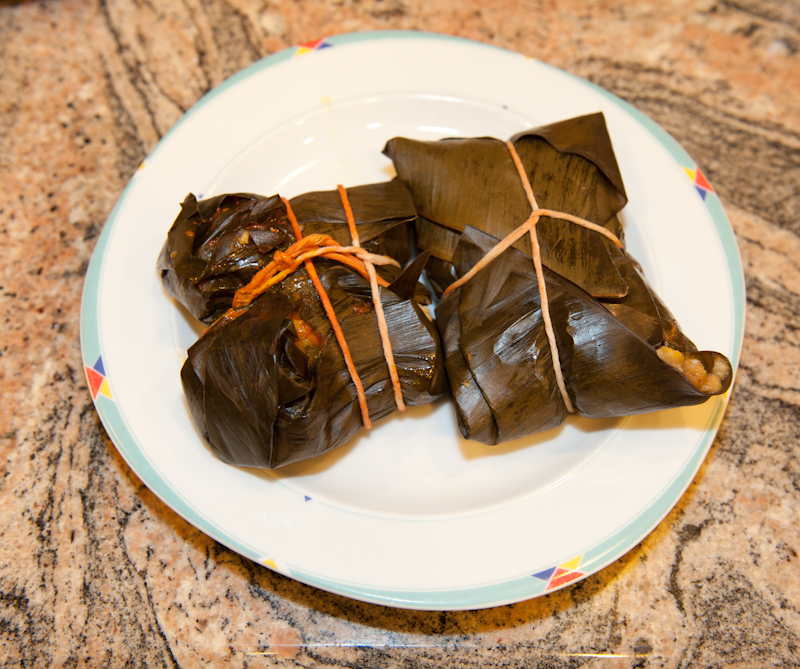 Briefly, both are savory ingredients with corn meal mush wrapped in a leaf and steamed. But, a nacatamale takes the concept to a whole new level. 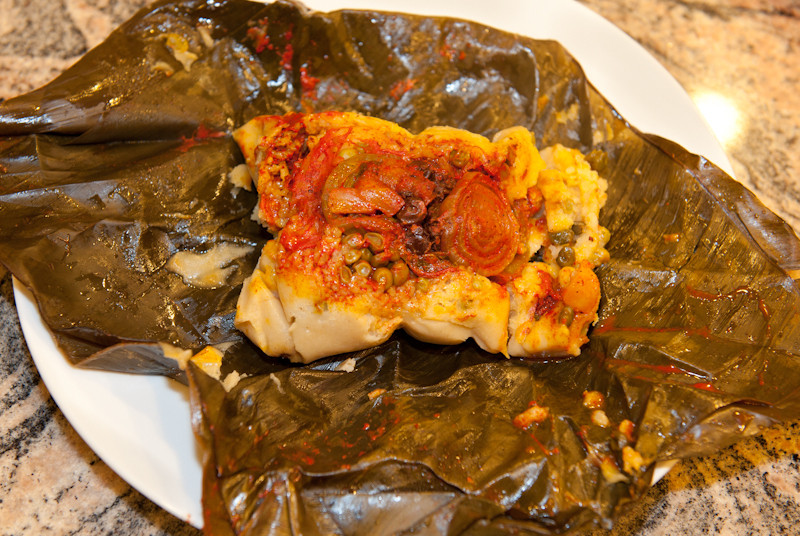 It is considered the national dish of Nicaragua, where I was first exposed to them and learned how to make them. I understand that other Central American countries, such as Honduras, have their own versions. They do take some time and effort and are traditionally a holiday or celebration feast. Banana leaves are used to wrap nacatamales. You can buy them frozen in most Latino markets. Cut crossways into 12-14 inch lengths, rinse, and set aside. You’ll need 2 or 3 sections per nacatamale. Just in case you were wondering, you do not eat the leaves! 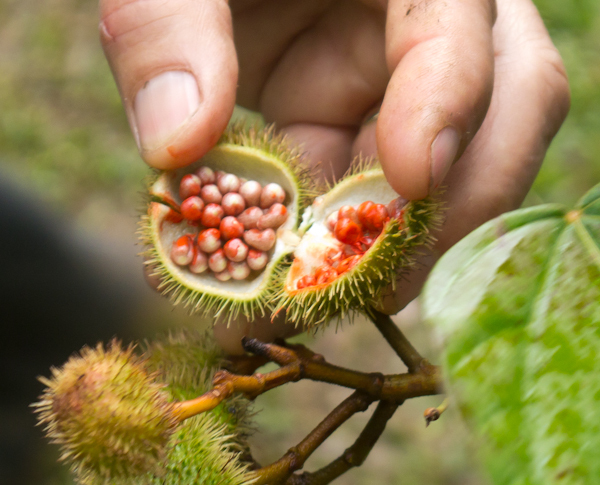 The central spice in nacatamales is achiote (or achote), also called annatto. It can be obtained at most Mexican / Latino markets as either a paste or a powder. It’s bright red and has a unique flavor that I love. I’ve seen nacatamale recipes without achiote but I think it’s essential. Here’s a photo of achiote seeds in their pod. Tradition says to use pork, either pork shoulder or boneless country-style ribs, cut into ~1 inch pieces. Chicken is less traditional but also tastes great. You can use whole drumsticks if you can get relatively small ones or boned thighs. I recommend against using the breasts because they tend to be dry. Anyway, put the meat in a bowl, season with salt and pepper, and toss with enough achiote to cover. Set in the fridge. 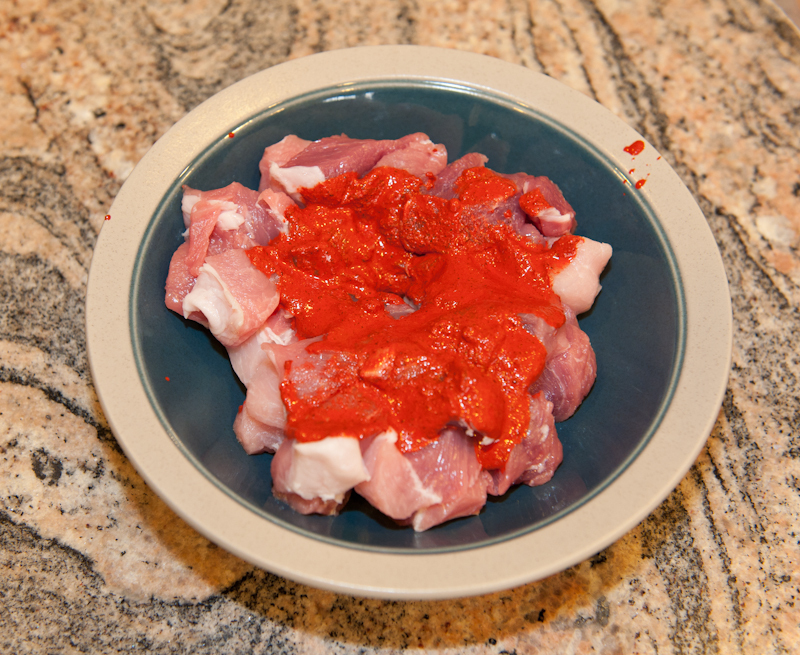 The photos shows cubed pork with achiote before being mixed. The dough is made from masa harina, available widely in Mexican markets and many supermarkets. Be sure to use masa and not regular cornmeal. Masa is made from hominy, corn that has been treated with lime to change some of its properties and make it more nutritious—it’s also what tortillas are made from. The other dough ingredients are lard and a liquid. The quality of your nacatamales depends in large part on the quality of the dough, and the dough contains fat – traditionally, lard (rendered pork fat). This presents 2 problems. First, some people shy away from lard because of its supposed health dangers (widely overblown, in my opinion). Second, it can be difficult to get good lard—the canned supermarket stuff has additives and is processed to where it’s a pale shadow of the real stuff. So, ideally you will find a source for good lard. Lacking that you can use the store-bought or substitute with butter or solid vegetable shortening. The liquid is usually chicken stock but can be milk, water, vegetable stock, etc. Use a mixer or pastry blender to incorporate the lard and salt into the masa until you have a texture like coarse cornmeal. Vigorously beat in the lime/orange juice and most of the liquid, adding more as needed to get a consistency a bit stiffer than mashed potatoes. Beat on medium-high for a couple more minutes – this makes the dough a bit fluffier by incorporating some air. Set aside for 30 minutes or more. In addition to the masa and meat, nacatamales contain a veritable cornucopia of other ingredients.The first 5 listed and the mint seem to be “standard,” with the remaining ones added, perhaps a tablespoon or 2 of each, as taste and availability permit. Here you see the various fillings ready for assembly. Depending on your liking for the achiote flavor, and the amount you put on the meat, you may want to add a bit more. I mix a sauce of equal parts of achiote paste and water to do this. 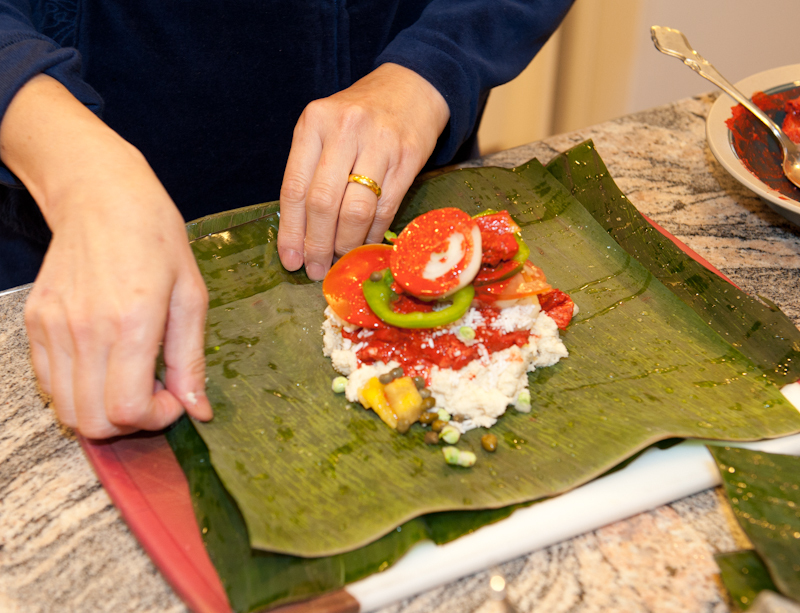 Place 2 or 3 banana leaf sections on your counter, overlapping, with the long edge toward you (if your sections are square, not to worry). Place not-quite-a cup of masa in the center and flatten a bit with your fingers. 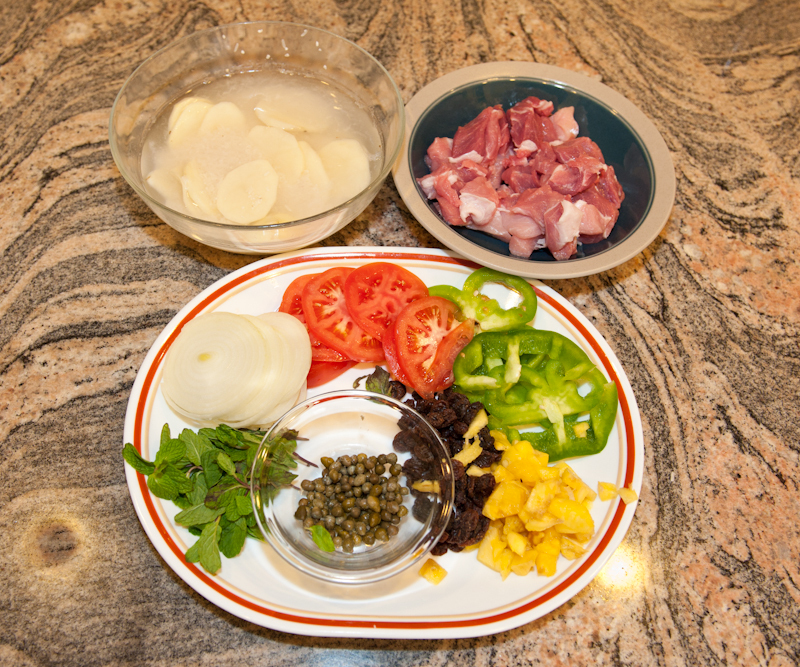 Start piling the ingredients on, typically 3-4 pieces of pork, 1 slice each of potato, tomato, pepper, and onion, a TB of rice (drained), a TB or so of the each of the smaller items, a mint spring, and 1-2 TB of the achiote sauce (if using). Fold the long edges together, fold the joined edges over each other about an inch at a time until snug, then fold the 2 sides in. It should be a snug wrap but not too tight because the masa expands a little while cooking, Then, tie together with cotton kitchen string. 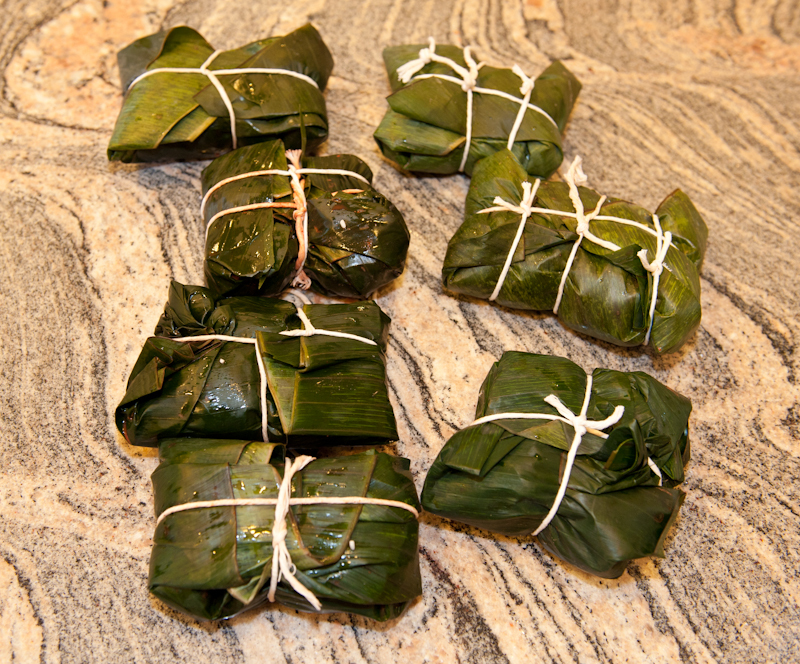 The photos show an assembled but not wrapped nacatamale and then all of them tied and ready to be cooked. Place the nacatamales on a rack in a large pot. You can stack them 2-3 deep. Put an inch or so of water in the pot (the nacatamales should not be in contact with the water). Bring to a boil, cover, and reduce heat to medium. Steam for 3 hours, adding water now and then to make sure the pot does not boil dry. You may see a little masa leaking out, particularly if you are not experienced at the wrapping, but this is OK.
After the 3 hours, remove the nacatamales from the pot and remove the string. Each diner gets a still-wrapped nacatamale to open themselves. This entry was posted on February 12, 2012 at 2:28 pm and is filed under Ethnic, Miscellaneous. You can subscribe via RSS 2.0 feed to this post's comments. You can comment below, or link to this permanent URL from your own site. Like your bog but what’s that: deluxe and I found your Blog at Google. He probado los nacatamales de mi suegra pero no se ven tan deliciosos como este. Pienso hacerlos para el cumpleanos de mi hermana y despues les escribo para que sepan la opinion de los invitados.